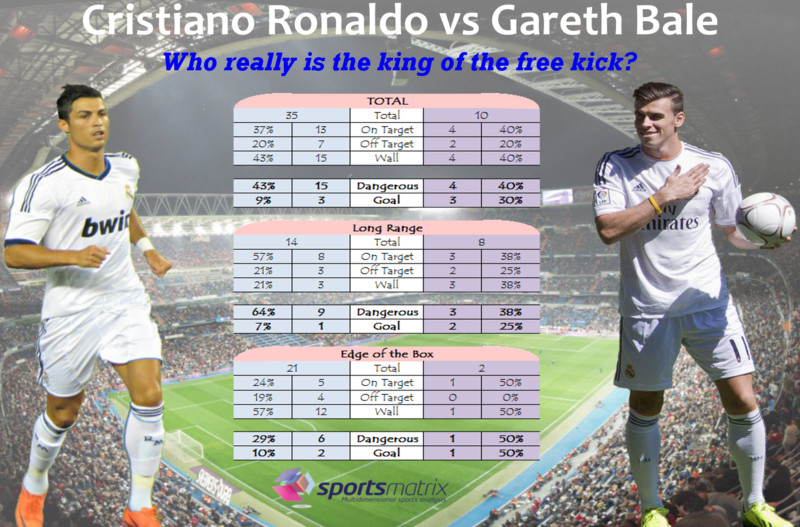 sportsmatrix » Are Ronaldo and Bale the Real Deal? Are Ronaldo and Bale the Real Deal? In our last post, we took an depth look at free kicks and which leagues are more lethal than others. We also found that a successful free kick is down to both the individual skill and lots of practice. One of the stories of the summer was Real Madrid’s chase and eventual signing of Gareth Bale. They already had the one of finest right footed free kick takers in the world in Cristiano Ronaldo and with the record fee paid; they now had one of the best left footed free kick takers. As a result, Real Madrid now have the perfect balance when it comes to taking free kicks and this is apparent in the fact that the team, as a whole, score from 11% of their free kicks. This is more than double the figure seen when looking at all teams in the Primera División (5%) and more than five times the amount in the Champions League (2%). As would be expected, they also have a significantly higher percentage of dangerous free kicks (47%) than that of the Primera División and Champions League which only have a 39% and 36% success rate respectively. With this in mind, we compiled a list of all of Ronaldo and Bale’s direct free kicks this season in both the Primera División and Champions League to see what we could find. Once we had this information in hand, we created a special infographic showcasing their incredible talent when it comes to this particular event. As can be seen in the infographic and as can be expected, Ronaldo takes the lion’s share of Madrid’s freekicks. The free kicks that were taken by Bale are generally those that require a left footed shot whereas Ronaldo, on the other hand, has taken those that can be done with a right foot. Despite the noticeable difference in number of free kicks taken, both players have a similar percentage of dangerous free kicks. Again, by dangerous we mean a free kick that ended in a goal or came very close to being a goal and not where the free kick was actually taken from. It is also interesting that they both scored 3 goals from their direct free kicks, despite the fact that Ronaldo took three times the number of free kicks. This begs the question of whether Bale should be allowed to try his luck more often. Another point that stood out was the difference in Ronaldo’s long range free kicks as opposed to the kicks that were taken on or around the edge of the box. His percentage of dangerous free kicks taken from distance is more than double than those taken much closer to goal. Added to this, more than half of his close range free kicks are blocked by the wall. This all being said, should Ronaldo get the ball past the wall, there is very little that the keeper is able to do and there is a very real chance that the free kick could end in a goal. It would be interesting to see if there’d be a difference in these stats if Ronaldo played in one of the leagues in the Americas where the referees use a kind of spray paint to ensure that the wall is exactly 9 metres away from the kicker. The bottom line is – concede a free kick to this duo at your peril! « Individual Brilliance or Just Plain Good Luck? Great post will probably be linking this on a couple of internet sites of mine keep up the excellent work. Clinton Digiuseppe on Group A Under the Microscope: Will the Indomitable Lions be Doing the Samba in Brazil? Decided On At The Moment. 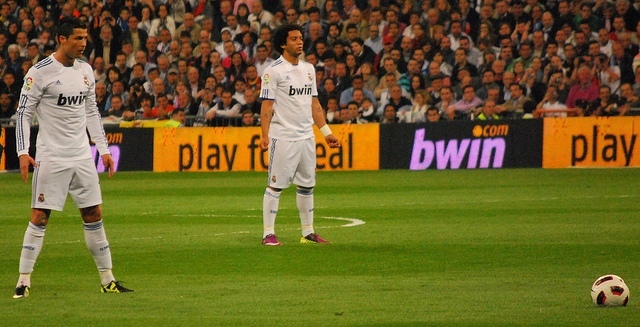 on Taking Stock – What Did We Learn from El Classico? Oakley Sis on Are Ronaldo and Bale the Real Deal? (Insert Name) Running Down the Wing…. | ... on (Insert Name) Running Down the Wing…. Copyright © 2019 sportsmatrix. Powered by WordPress & Corpo Theme.